A Voracious Appetite | Exploring my healthy appetite for life. Despite the heat wave that has overwhelmed the east coast, I used my oven this week. I know; I question my sanity sometimes too. But in the end it was worth it. 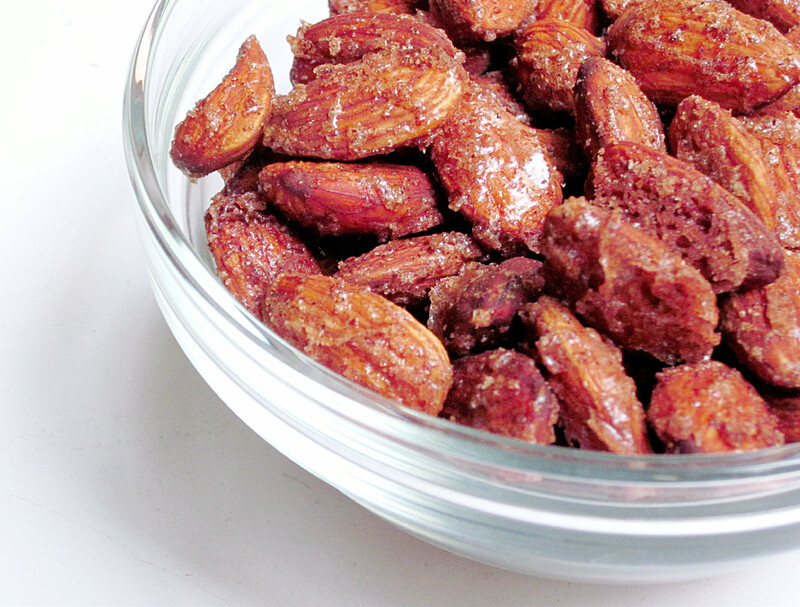 These cinnamon sugar roasted almonds really are delightful. Each bite is a cinnamon sugar coated treat! In a large bowl, mix almonds with canola oil and maple syrup until evenly coated. Sprinkle sugar and cinnamon over the nuts and combine to make sure each nut is coated. Spread the almonds on a baking sheet lined with parcment paper. 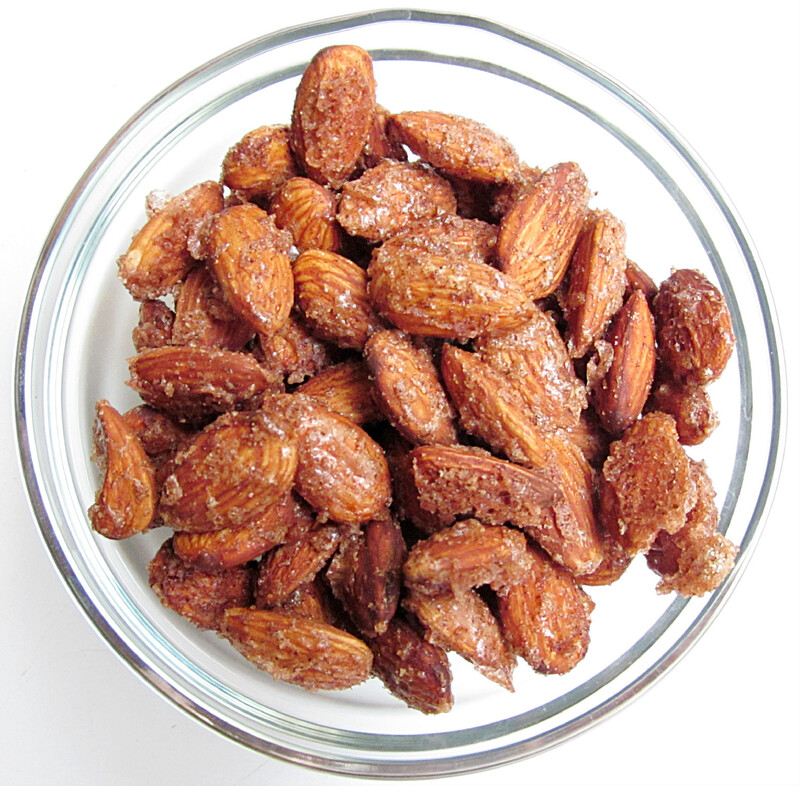 Roast the almonds for 20 minutes, stirring halfway through. Oh, why hello there blog world! I haven’t forgotten about you, even though it may appear that way. Life has been rather busy as of late. Between working full-time and planning a wedding, I have very little time (or brain power) for blogging. But I’m happy to report that my efforts dedicated towards wedding planning have proved fruitful. We’ve picked out the florist and cake designer we want to help us with our big day. I’m thrilled with how the planning is going! If you remember, in my last post I mentioned that I’m going to tackle the Insanity 60-day challenge. I’m two weeks into it and I have to say I’m really enjoying it. Now don’t get me wrong, the workouts are tough but I’ve found that my body is adapting rather quickly. Each week I’ve completed each workout before work. I expected to be tired throughout the day but the opposite has happened. I actually have more energy! Along with the workouts, I’ve been watching my diet closely. I’m striving for a clean diet composed of vegetables, fruit, lean protein, and whole grain carbs. So far it’s been easier than I thought. It helps that I’ve been able to create some tasty afternoon treats. This protein cake turned out much better than expected. Seriously, each time I eat a piece I wonder how something so healthy could taste so good. 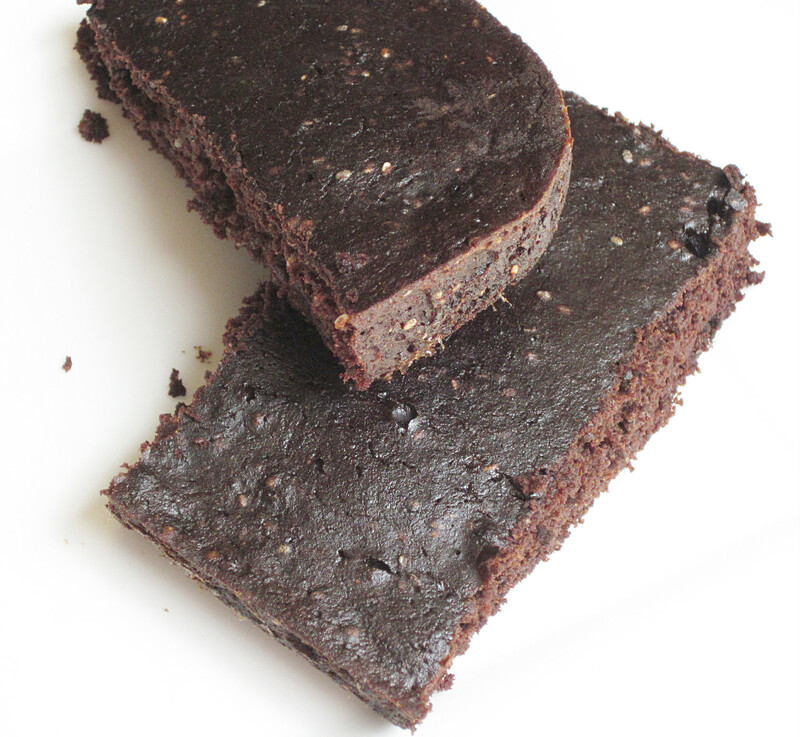 The cake is moist with a light crumb and the smallest amount of crunch from the chia seeds. I love adding chia seeds to different recipes because of their numerous health benefits but if you don’t have any, then you can easily leave them out. 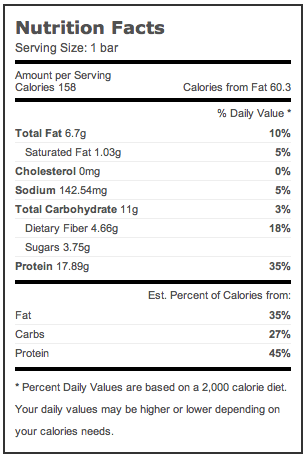 Before I get to the recipe, I have to show you the stats. You won’t believe it until you see it! How awesome is that?! 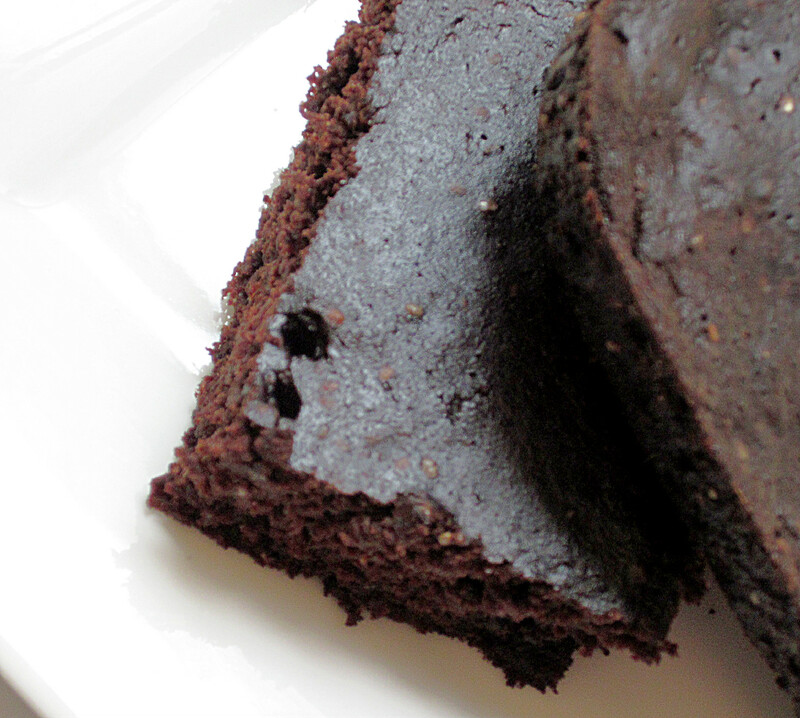 If you’re looking for a tasty, yet filling and healthy treat, this “cake” is a great choice. In a large bowl, combine protein powders, sugar, cocoa powder, and baking soda. Mix throughly with a fork to remove all lumps. In a separate bowl, whisk egg whites until foamy; about 2 to 3 minutes. Add almond butter, applesauce, and vanilla to protein powder mixture. 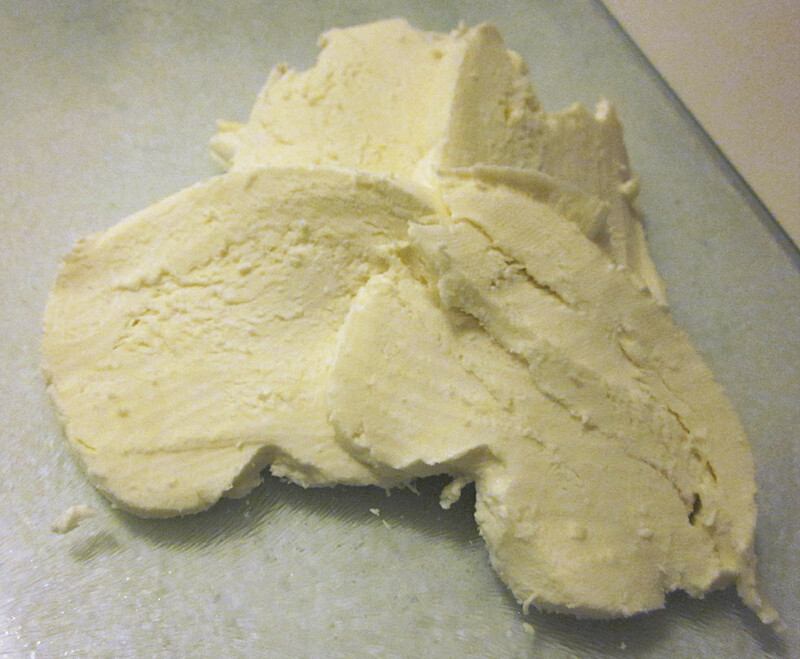 Mix until all ingredients are incorporated and the mixture forms a thick paste. Using a spatula, fold in egg whites. The mixture should become runny and resemble brownie batter. Fold in chia seeds until just combined. 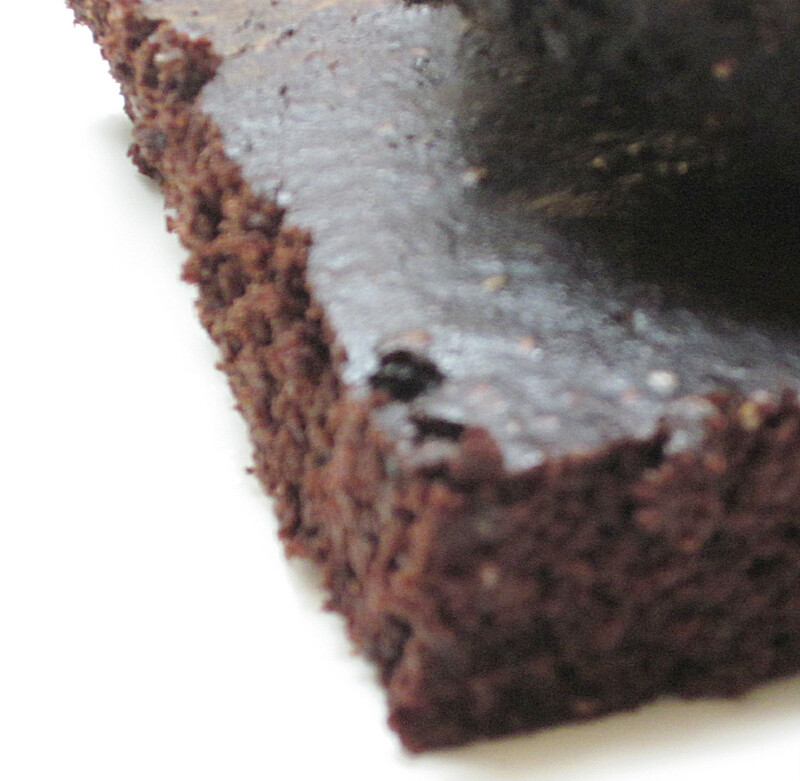 In a greased 8×8 pan, pour the mixture and spread it out so that it forms an even layer. Bake for 20 minutes or until a toothpick inserted in the middle comes out clean. 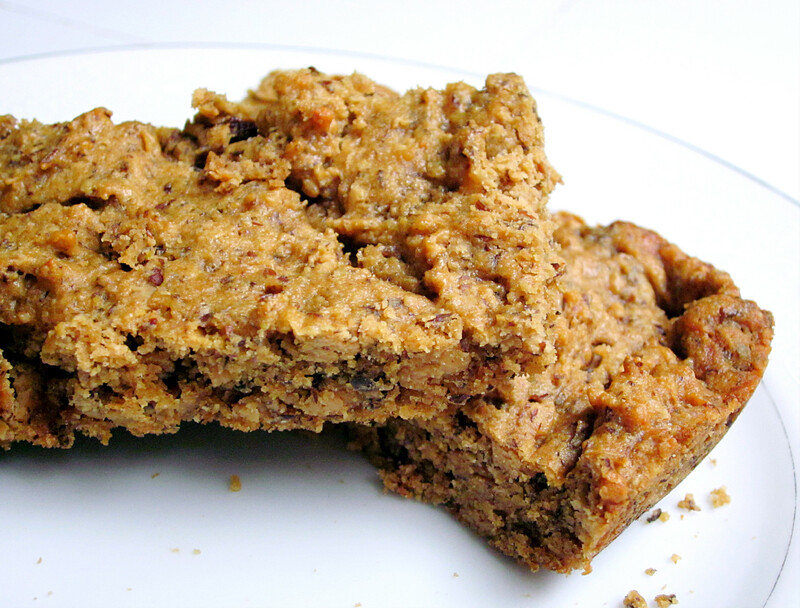 Allow to cool before cutting into bars or squares. Isn’t it always a shame when a three day weekend is over? If I had my way, every weekend would be a three day weekend. Who’s with me?! And, last but certainly not least, starting the Insanity 60-day challenge! Along with the workouts, came a nutrition plan that outlines a diet focused on balancing lean protein, carbohydrates, and healthy fats. Most of the meals that are suggested sound great and rather easy to prepare but as I was reviewing it I was struggling with the snack selections. Only a few items seemed portable, which is important as I’ll be eating my snacks at work. 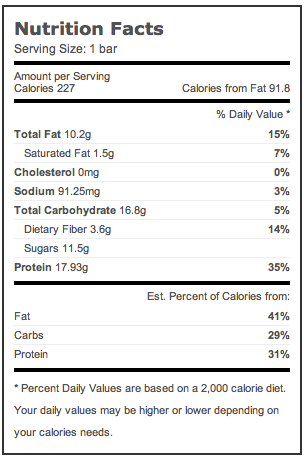 So, I decided to create my own protein bars as the perfect afternoon snack. I added some raisins for texture and taste but feel free to add whatever mix-ins you like; chocolate chips, peanuts, or rice cereal would all be great options. I have a few ideas of other flavors, so if you’re not a peanut butter lover, stay tuned. Hopefully I’ll be able to find something that suits everyone! 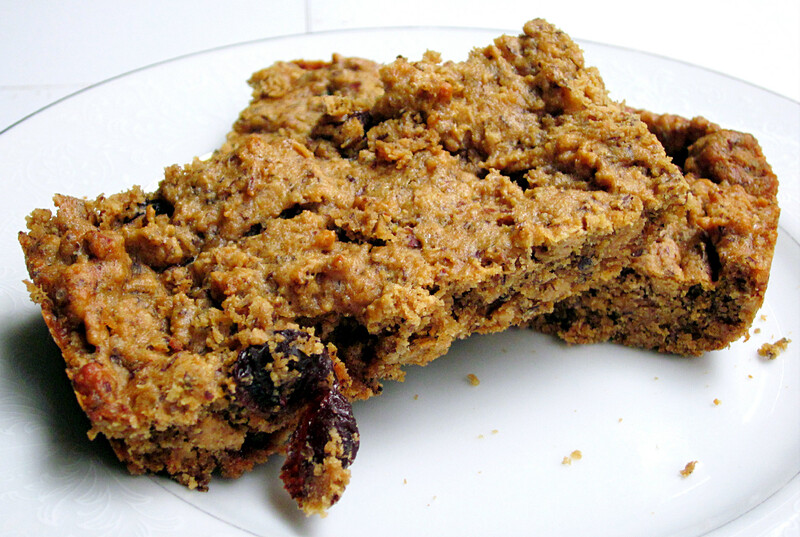 In a large bowl, combine protein powder(s), ground flaxseeds, sugar, and baking soda. 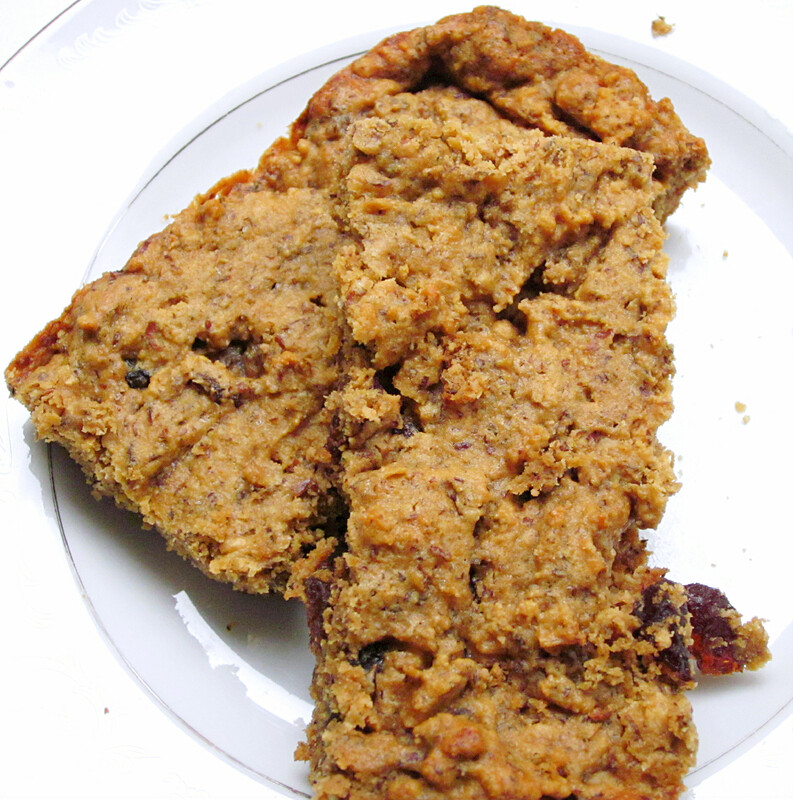 Slowly add peanut butter and vanilla to the dough, and mix until a crumbly texture forms. In a separate bowl, whisk the egg whites until they are foamy (about 2 to 3 minutes). Fold in egg whites until just combined. Add raisins and until incorporated. Allow to cool before cutting into 8 bars. Again, these bars were great! If you’re looking to keep them completely vegan, try substituting two flax “eggs” for the egg-whites. I can’t say that you’ll have the same results but it’s worth a try. Let me know if you do! Have you ever created your own recipe from scratch? Was it a success or not so much? Hi there! I’m just popping in today to let you know that I created a stellar new nut butter. Cinnamon Vanilla Bean Almond Butter, anyone? 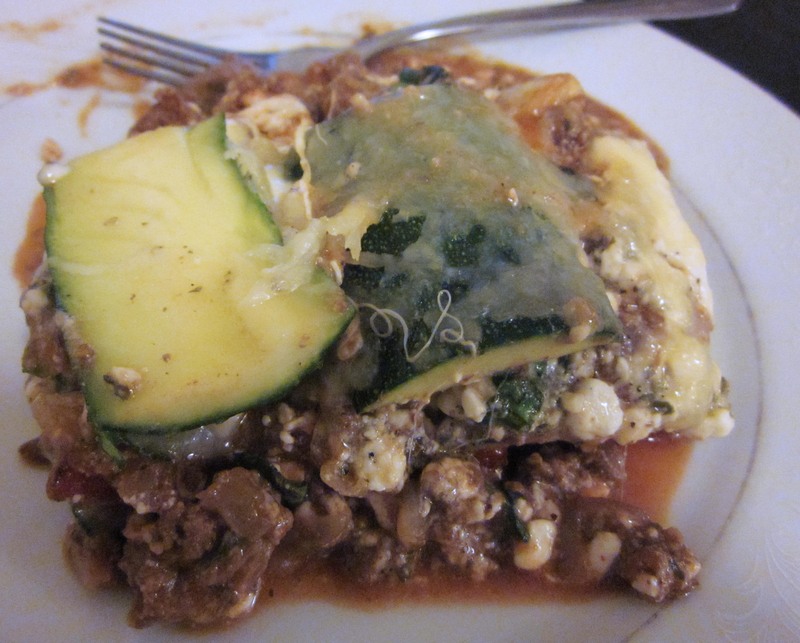 If you said “Yes, please!”, then head on over to Get Healthy with Heather to get the recipe. One of the best things about the blogging community is its infinite amount of inspiration. There are so many bloggers and countless recipes that the possibilities are truly endless. 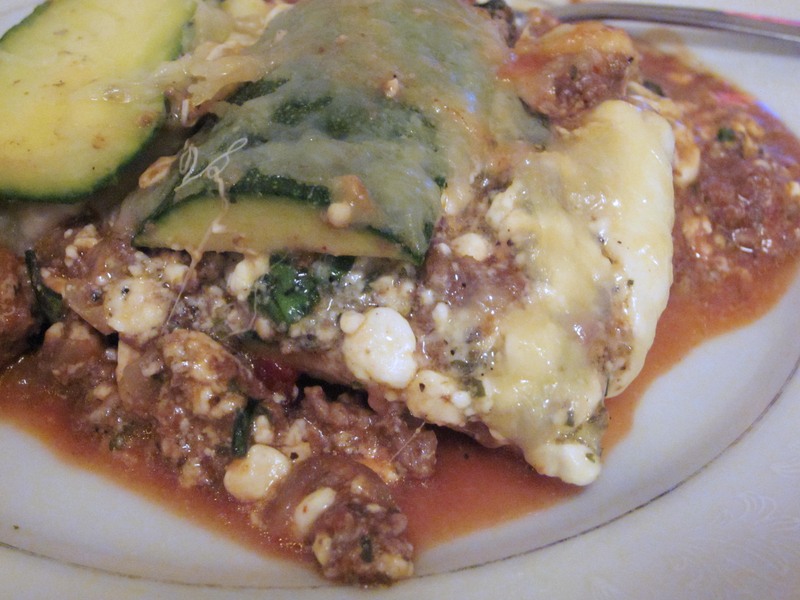 This recipe is the love child of two stellar recipes, Lightened-up Lasagna from meals & moves and Zucchini Quinoa Lasagna from Peas and Thank You. Place an oiled skillet over medium heat and cook onions until translucent, about 5 minutes. Add ground beef and cook until browned. Drain fat once the beef is cooked through and add the tomato sauce to the skillet. Heat thoroughly. Meanwhile, in a small bowl, mix cottage cheese, egg, and parsley through pepper. Lightly oil a 9×5 loaf pan. 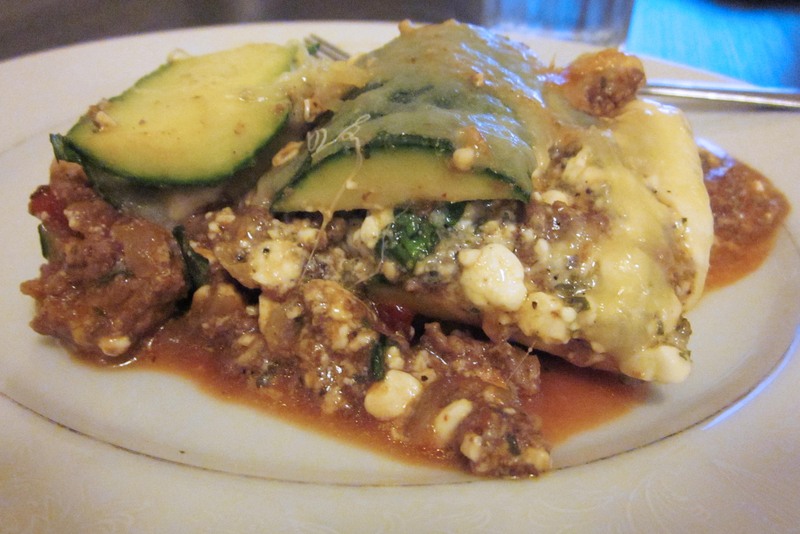 Begin layering your ingredients; start with a single layer of zucchini, then add half the cottage cheese mixture, and half the beef mixture. Repeat once more and top the final layer with shredded cheese. Cover with foil and cook for 15 minutes. Remove the foil and cook for another 10 minutes, or until cheese begins to bubble. What recipes blog-inspired recipes have you created? 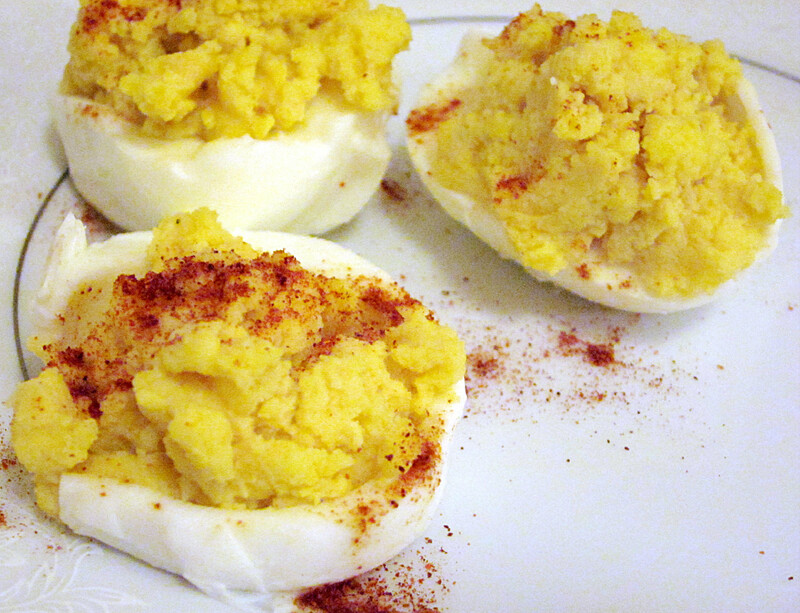 Deviled eggs always remind me of picnics. When I was a kid, my mom would make them as a special treat to have along with our sandwiches and juice boxes. We’d eat them on top of a picnic blanket while waiting for the 4th of July fireworks or in the backseat of the car after a fun day at the amusement park. While I love my mom’s version and they’re great for an occassional treat, I decided to make a lighter version that can be enjoyed more frequently. In place of mayo, I used protein packed Greek Yogurt which made for an extra creamy filling and a little bit of hummus provided a whole lot of flavor. These deviled eggs would be great as a healthy appetizer served before a meal off the grill or as lighter finger food when you have a few friends over. You could even make a meal out of them, much like Alex and I did. You and your guests won’t be disappointed. To hard boil the eggs, place them in a saucepan and fill the pan with cold water just until the eggs are covered. Place the pan over high heat and bring the water to a boil. Once it is boiling, cover the pan and remove it from the heat. Leave the cover on for 12 to 14 minutes. Drain the hot water and dunk the eggs into ice water. Let them sit in the water until they are cool to the touch. Peel the eggs. Slice the eggs lengthwise and place the yolks into a small bowl. Add the rest of the ingredients, except paprika, to the bowl and mix with a fork. Fill each egg white with a scoop of filling and dust with paprika. Do you have food that reminds you of summer time picnics? 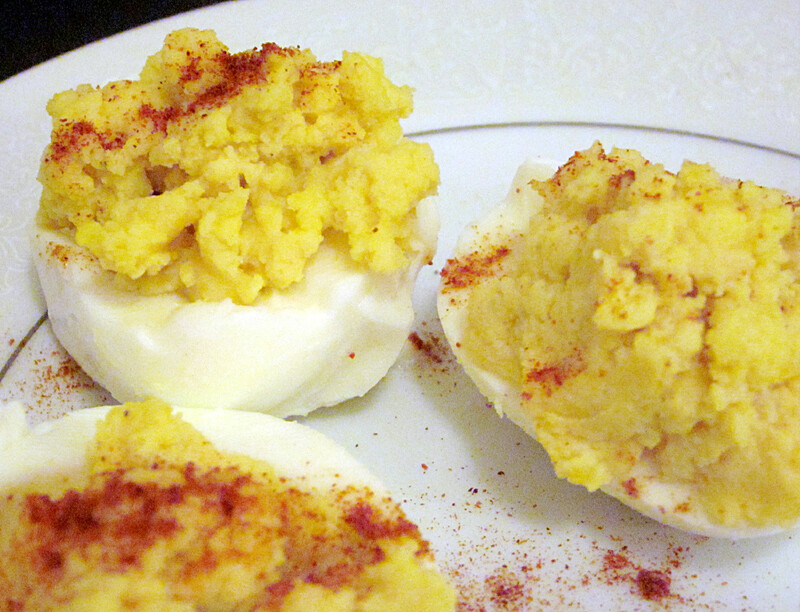 Do you like deviled eggs? Without question, the combination of fresh mozzarella, plump tomatoes, and fragrant basil is divine. Caprese salad is the quintessential summer salad; summer being the peak season for each component. It is refreshing and satisfying without weighing you down. What better recipe to share for the first day of summer than a chicken dish inspired by this delightful salad? Preheat oven to 350 degrees. Slice chicken breasts open on the side so that a nice, long pocket forms. Cover the interior of the chicken breast with one tablespoon of pesto. 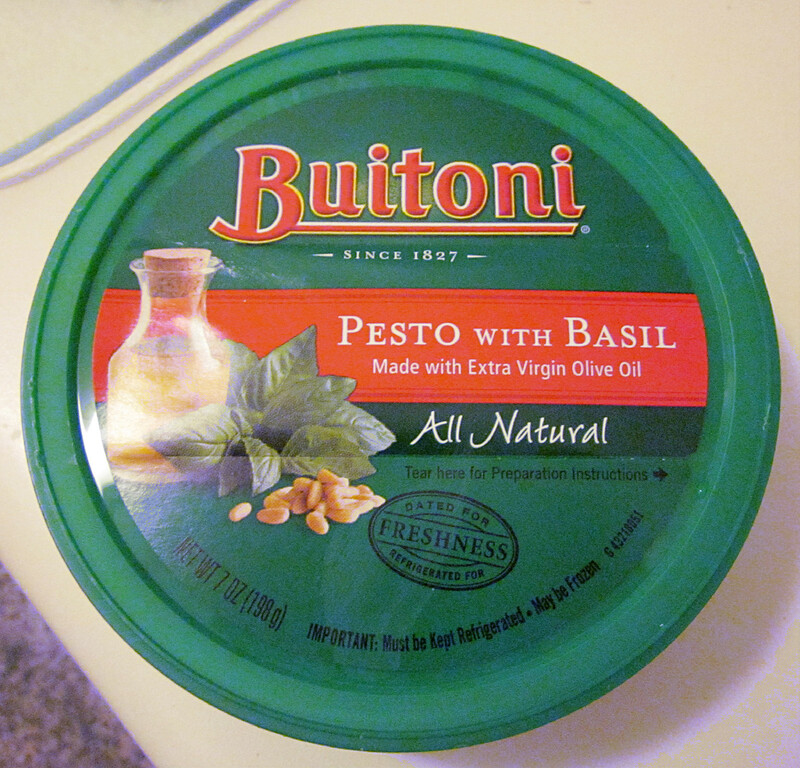 I used Buitoni. Next, slice the mozzarella and dice the basil. 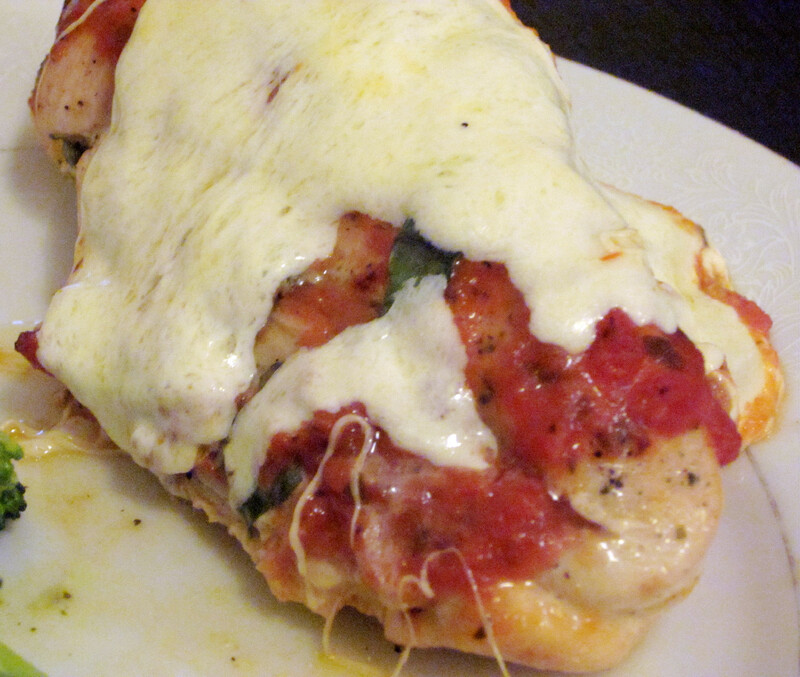 Insert one slice of mozzarella and one tablespoon of basil into each chicken breast. Season the exterior of the breasts with salt and pepper. Heat olive oil in a skillet over medium heat. Sear the breasts for one minute per side then cook the breasts on a greased baking sheet for 10 minutes. Remove from the oven and top each breast with about two tablespoons of tomato sauce. 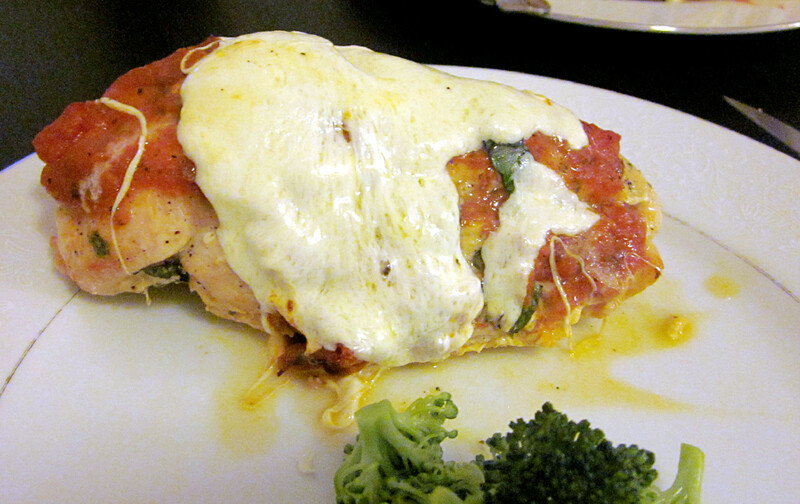 Cook for another 15 minutes and then top the chicken with a slice or two of mozzarella. Cook for another 5 minutes, until the cheese is melted. This dish was so flavorful! The pesto on the interior of the chicken breast added so much to the dish but the true star of the show was the mozzarella. It was perfect melted both on top and inside the chicken. I’ll definitely be making this dish again! Have you ever had caprese salad? 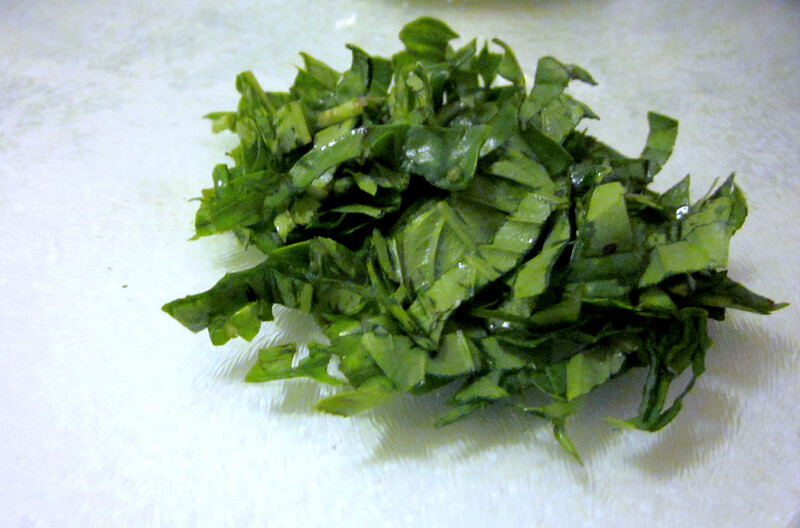 Do you have any derivations from the traditional recipe?